Cinderella Imported Shoppe in Jubilee Hills is your one-stop shop for all things imported. From exotic chocolates to high-end brands of watches, perfumes, electronics, their collection is impressive. Passing by Road No. 92 in Jubilee Hills, Cinderella Imported Shoppe might look like a regular store with a fancy name, but don’t be fooled. 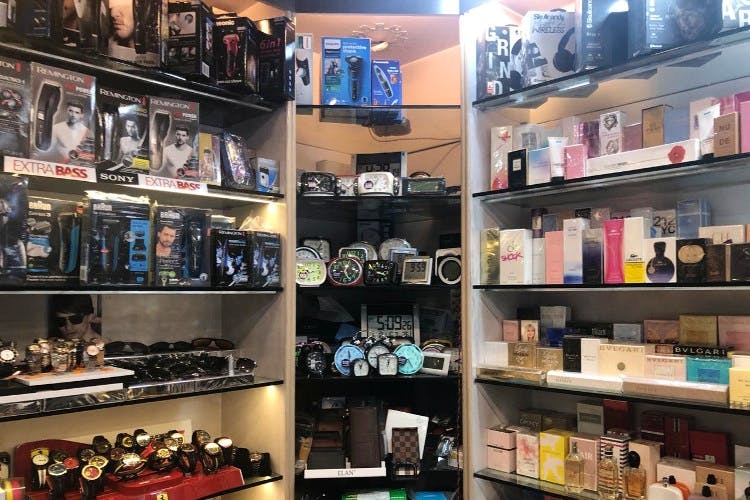 It is indeed a shop where you can get the best imported products that include clothes, accessories, beauty products, crockery, chocolates, electronics, souvenirs, and more. It is a small shop but quite a vibrant and chirpy one. Find menswear and men’s accessories as you enter, which has perfumes from brands like Burberry, Armani, Versace, and Dior, wallets from Michael Kors, watches from Guess and socks from Calvin Klein. Yes, it’s raining brands here, but wait till you check out the rest of the store. Cosmetics from German brand BeYu and body lotions and mists from Victoria’s Secret adorn the shelves of this store along with Hamaam El Hana essential oils and Beardo beard care products. There are also imported night dresses for ladies that are comfy and cute, and available in different sizes too. Stacks of mouth-watering chocolates from Hersheys and Raffaelo to Lindor and Toblerone will make you gleam in joy for you don’t have to wait for a visiting cousin or relative to enjoy these treats anymore. Among other things we found were Swissgear backpacks, Skullcandy headphones, portable chargers, travel sockets, pretty crockery and cute souvenirs (fridge magnets from Thailand, London, and the USA). Wine glasses and shot glasses to add to your collection and faux Chanel and Fendi handbags are on display here, if you’re into that. You can find imported footwear as well, but it’s mostly casual or slippers, so we’d pass on that. Check out the home decor products too — flower pots and poly-fiber sculptures made in Thailand. So, the next time you want to own something that may not be otherwise available in India, make a trip to this shop and it might surprise you. And, oh did we mention how our gifting woes are sorted?